On Thursday, a Twitter account posted a video that is in no way for the faint of heart. The short clip is of a woman, a maid, hanging from a window on the seventh floor of a building. The viewer watches with horror as she falls to the ground below after pleading for help from the woman filming. You read that right. Instead of helping the maid, the woman stood there and filmed the whole thing. 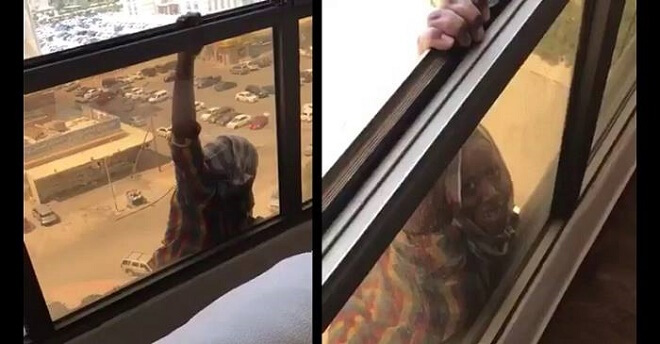 The post, uploaded by @Almajlliss, was captioned by a news service in Kuwait with the following: “When humanity is absent because of the mobile video.” The woman filming even spoke to the dangling maid before she fell. In the comments, when a user asked for a translation of her words, another user replied that the woman said, “You crazy! Come here!” As if the woman — who, incidentally, is hanging on by one hand — was just having a laugh. Amazingly, the maid lived. A witness on the ground — as in the ground the maid plummeted to — filmed what followed. This second clip shows firefighters attempting to help the clearly dazed woman down a ladder. As far as commentary on the digital age goes, this one pretty much speaks for itself. These are crazy times, indeed.